If the idea of wearing metal braces has prevented you from seeking treatment for an overbite, Invisalign® orthodontics may be the right treatment for you. Invisalign® offers discreet orthodontic treatment using clear aligners, enhancing the smile without the use of metal braces. To find out if Invisalign® for overbite is right for you, contact Skillman, NJ cosmetic dentist James Altomare. In the meantime, let's explore how Invisalign® can help treat overbites. An overbite is an alignment issue in which the front upper teeth overlap the front lower teeth. An overbite may be caused by heredity or may develop over time as a result of certain habits. Some of these habits include long-term bottle use, pacifier use, and thumb sucking. Tongue thrust, a swallowing reflex disorder, in which the tongue pushes into the upper teeth instead of the roof of the mouth may also cause an overbite to develop. Overbites are either dental or skeletal in nature. A dental overbite is characterized by the teeth protruding forward and is commonly known as “buck teeth.” A skeletal overbite is characterized by the jaw protruding forward. In some cases, either form of overbite may be severe enough to allow the lower teeth to bite into the roof of the mouth. Invisalign® orthodontics offers discreet treatment of mild to moderate overbites in addition to many other alignment issues. Invisalign® realigns the teeth without the use of metal braces. Instead, a series of clear, custom-made aligner trays are worn to gently correct the position of the teeth. When used to treat overbites, Invisalign® trays must be worn for 22 hours a day and may be removed while eating and to brush and floss the teeth. Each set of trays is worn for two weeks before changing to a new set of trays until the desired alignment is achieved. The total length of time necessary for correcting an overbite with Invisalign® will depend on the severity of alignment issues. In most cases, Invisalign® treatment for overbites will take around nine months to a year. 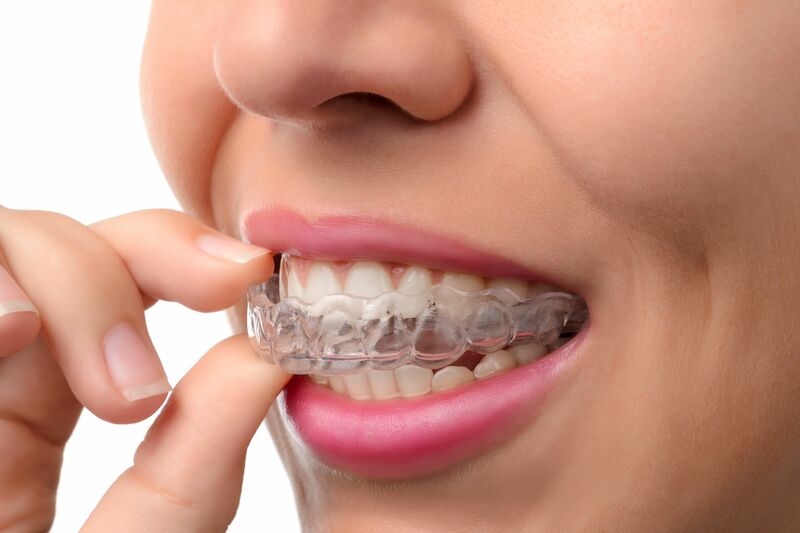 Comfortable treatment: Invisalign® aligners are more comfortable than metal braces and won't irritate the inside of the mouth as can happen from the brackets and wires of metal braces. Easy to maintain oral hygiene: Invisalign® trays are removable, making it easy to maintain good oral hygiene during treatment. Improved alignment: Invisalign® orthodontic treatment can correct overbites and other alignment issues to create a beautiful, straight smile. Improved confidence: Invisalign® helps those who are unhappy with the appearance of misaligned teeth gain the confidence of a beautifully aligned smile. If you have an overbite, Invisalign® may be right for you. To find out if you're a candidate, we welcome you to schedule a consultation with Dr. Altomare.